The torrential rain was the biggest talking point of a first half that saw the East Cornish side go in 6-0 up courtesy of 2 Ben Hobbs penalties. Bemusingly, Argaum insisted on attempting to play a 15 man game to no avail, whilst St Columba concentrated on the kick and chase which regularly won them territory. Argaum stay joint top of Tribute South & West Devon 1 as the winning streak continued against their cross-Tamar rivals at Defiance Field. Argaum presented Tommy Cooper with a win, before the club stalwart and player for 22 years, hangs up his boots and moves out of the area. IT WAS undecided after 80 minutes at Defiance Field where St Columba gave up an early lead and fought back to take a draw in the final stages. St. Columba were unable to hold the unbeaten Argaum team at Roborough, but succeeded in scoring a try through Keast, which broke their opponents' line record. Argaum, whose total comprised two goals and five tries, led 9—3 at the interval, their scorers being Hughes and two by Kingwell, who injured a shoulder in touching down his second try. After the interval tries were added by Daly, Littler, Farren, and Metters, who at full-back also goaled two. 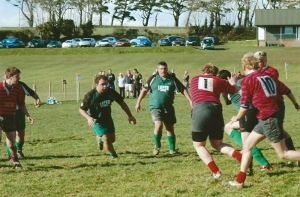 Plymouth Argaum Extra XV. 12pts St Columba A 0. An open game in Central Park was notable for the excellent defensive play by both sets of threequarters, but Argaum, with greater thrust and alertness the loose, deserved their win by four tries to nil. St. Columba, who were well represented at left-centre by Toole, lost much of their fire when Summers was injured in the second half. O'Carroll and Nicholls, the fullbacks, enjoyed a rare duel, and play was confined to midfield for long periods. Linehan and Chiswell scored two tries apiece for Argaum.